Bergh, Andreas Erlingsson, Gissur Gustafsson, Anders and Wittberg, Emanuel 2019. Municipally Owned Enterprises as Danger Zones for Corruption? How Politicians Having Feet in Two Camps May Undermine Conditions for Accountability. Public Integrity, p. 1. Buttorff, Gail J. 2019. Authoritarian Elections and Opposition Groups in the Arab World. p. 57. Buttorff, Gail J. 2019. Authoritarian Elections and Opposition Groups in the Arab World. p. 39. Gervasoni, Carlos 2018. Hybrid Regimes within Democracies. Mantilla, Luis Felipe 2018. Faith and experience. Party Politics, Vol. 24, Issue. 4, p. 370. Baykan, Toygar Sinan 2018. The Justice and Development Party in Turkey. Washida, Hidekuni 2018. The origins and (failed) adaptation of a dominant party. Asian Journal of Comparative Politics, p. 205789111877175. Way, Lucan Ahmad and Casey, Adam 2018. The structural sources of postcommunist regime trajectories. Post-Soviet Affairs, Vol. 34, Issue. 5, p. 317. Sawasdee, Siripan Nogsuan 2018. The conundrum of a dominant party in Thailand. Asian Journal of Comparative Politics, p. 205789111877464. Tsubura, Machiko 2018. “Umoja ni ushindi (Unity is victory)”: management of factionalism in the presidential nomination of Tanzania's dominant party in 2015. Journal of Eastern African Studies, Vol. 12, Issue. 1, p. 63. Nichter, Simeon 2018. Votes for Survival. Daghagheleh, Aghil 2018. Ambivalent Voting Behavior: Ideology, Efficacy, and the Socioeconomic Dynamic of Voter Turnout in Iran, 1997-2005. Sociological Forum, Vol. 33, Issue. 4, p. 1023. Why have dominant parties persisted in power for decades in countries spread across the globe? Why did most eventually lose? Why Dominant Parties Lose develops a theory of single-party dominance, its durability, and its breakdown into fully competitive democracy. Greene shows that dominant parties turn public resources into patronage goods to bias electoral competition in their favor and virtually win elections before election day without resorting to electoral fraud or bone-crushing repression. Opposition parties fail because their resource disadvantages force them to form as niche parties with appeals that are out of step with the average voter. When the political economy of dominance erodes, the partisan playing field becomes fairer and opposition parties can expand into catchall competitors that threaten the dominant party at the polls. Greene uses this argument to show why Mexico transformed from a dominant party authoritarian regime under PRI rule to a fully competitive democracy. Abramson, Paul, John, Aldrich, and David, Rohde (1994) Change and Continuity in the 1992 Elections. Washington, DC: CQ Press. Adams, James (1999) “Policy Divergence in Multicandidate Probabilistic Spatial Voting” Public Choice 100: 103–122. Adams, James, Samuel, Merrill III, and Bernard, Grofman (2005) A Unified Theory of Party Competition. New York: Cambridge University Press. Aguilar, Zinser (1995) Vamos a ganar! La pugna de Cuauhtémoc Cárdenas por el poder. Mexico City: Oceano. Aldrich, John (1983) “A Downsian Spatial Model with Party Activism” American Political Science Review 77, 4: 974–990. Aldrich, John (1993) “Rational Choice and Turnout” American Journal of Political Science 37, 1: 246–278. Aldrich, John (1995) Why Parties? The Origin and Transformation of Political Parties in America. Chicago: University of Chicago Press. Aldrich, John and William, Bianco (1992) “A Game-Theoretic Model of Party Affiliation of Candidates and Office Holders” Mathematical and Computer Modeling 16, 8–9: 103–116. Alesina, Alberto and Stephen, Spear (1988) “An Overlapping Generations Model of Electoral Competition” Journal of Public Economics 37, 3: 359–79. Alvarez, R. Michael and Jonathan, Nagler (1998) “When Politics and Model Collide: Estimating Models of Multiparty Elections” American Journal of Political Science 42, 1 (June): 55–96. Alves, Maria Helena (1985) State and Opposition in Military Brazil. Austin: University of Texas Press. Ames, Barry (1970) “Bases of Support for Mexico's Dominant Party” American Political Science Review 64, 1: 153–167. Arian, Alan and Samuel, Barnes (1974) “The Dominant Party System: A Neglected Model of Democratic Stability” Journal of Politics 36, 3 (August): 592–614. ArredondoRamírez, Pablo Ramírez, Pablo, Gilberto, Fregoso Peralta, and Raúl Trejo, Delabre (1991) Así se calló el sistema: Comunicación y elecciones en 1988. Guadalajara: University of Guadalajara. Arrellano, David and Juan Pablo Guerrero (2000) “Stalled Administrative Reform of the Mexican State” in Schneider, B. and Heredia, B. (eds.) Reinventing Leviathan: The Political Economy of Administrative Reform in Developing Countries. Miami: North-South Center Press. Arriola, Carlos (1988) Los empresarios y el estado, 1970–1982. Mexico City: Porrúa. Arriola, Carlos (1994) Ensayos sobre el PAN. Mexico: Porrúa. Aspe, Pedro (1993) Economic Transformation the Mexican Way. Cambridge: MIT Press. Bailey, John (1988) Governing Mexico: The Statecraft of Crisis Management. New York: St. Martin's Press. Banks, Jeffrey and Roderick, Kiewiet (1989) “Explaining Patterns of Candidate Competition in Congressional Elections” American Journal of Political Science 33, 4: 997–1015. Barnes, Samuel and Roy, Pierce (1971) “Public Opinion and Political Preference in France and Italy” Midwest Journal of Political Science 15, 4: 643–660. Bartels, Larry (1986) “Issue Voting Under Uncertainty: An Empirical Test” American Journal of Political Science 30, 4 (November): 709–728. Bartra, Roger (1987) La jaula de la melancolía: identidad y metamorfosis del mexicano. Mexico: Grijalbo. Bartra, Roger (1989) “Changes in Political Culture: The Crisis of Nationalism” in Cornelius, W., Gentleman, J., and Smith, P. (eds.) Mexico's Alternative Political Futures. La Jolla: Center for U.S.-Mexican Studies. Basañez, Miguel (1983) La lucha por la hegemonía en México, 1968–1980. Mexico City: Siglo Veintiuno. Basañez, Miguel (1996) El pulso de los sexenios: 20 años de crisis en México. Mexico City: Siglo Veintiuno. Beck, Thorsten, George, Clarke, Alberto, Groff, Philip, Keefer, and Patrick, Walsh (2001) “New Tools in Comparative Political Economy: The Database of Political Institutions” World Bank Economic Review 15 (February): 165–176. Berton, Peter (2000) “Japanese Communist Party: The ‘Lovable’ Party” in Hrebenar, R.Japan's New Party System. Boulder: Westview Press. Besley, Timothy and Steven, Coate (1997) “An Economic Model of Representative Democracy” Quarterly Journal of Economics 112, 1: 85–114. Blondel, Jean (1972) Comparing Political Systems. New York: Praeger. Boix, Carles (1998) Political Parties, Growth and Equality. New York: Cambridge University Press. Boix, Carles (2003) Democracy and Redistribution. New York: Cambridge University Press. Boix, Carles and Susan, Stokes (2003) “Endogenous Democratization” World Politics 55, 4 (July): 517–549. Adriana, Borjas Benavente (2003) Partido de la Revolución Democrática: Estructura, organización interna y desempeño público, 1989–2003. Mexico City: Gernika. Bortolotti, Bernardo (2005) “Italy's Privatization Process and its Implications for China” Fondazione Eni Enrico Mattei Working Paper No. 118, Milan, Italy. Bouton, Lawrence and Mariusz, Sumlinski (2000) “Trends in Private Investment in Developing Countries” International Finance Corporation Paper 41. Washington, DC: World Bank. Brandenburg, Frank (1956) Mexico: An Experiment in One-Party Democracy. Philadelphia: University of Pennsylvania. Brandenburg, Frank (1964) The Making of Modern Mexico. Englewood Cliffs, NJ: Prentice Hall. Brody, David and Benjamin, Page (1972) “Comment: The Assessment of Policy Voting” American Political Science Review 66, 2 (June): 450–458. Brooker, Paul (2000) Non-Democratic Regimes: Theory, Government and Politics. New York: St. Martin's Press. Brownlee, Jason (2005) “Ruling Parties and Durable Authoritarianism” Working Paper No. 23, Center on Democracy, Development, and the Rule of Law, Stanford University. Bruhn, Kathleen (1996) “Social Spending and Political Support: The ‘Lessons’ of the National Solidarity Program in Mexico” Comparative Politics 28, 2: 151–177. Bruhn, Kathleen (1997) Taking on Goliath: The Emergence of a New Left Party and the Struggle for Democracy in Mexico. University Park: Pennsylvania State University Press. Bruhn, Kathleen (2000) “The Importance of Being Cuauhtémoc: The 2000 Presidential Campaign of the PRD.” University of California, Santa Barbara, mimeo. Bruhn, Kathleen (2001) “Party Ideological Placement and the Left-Right Cleavage: A Reassessment from the South.” University of California, Santa Barbara, mimeo. Bruhn, Kathleen (2004) “The Making of the Mexican President 2000: Parties, Candidates, and Campaign Strategy” in Domínguez, J. and Lawson, C. (eds.) Mexico's Pivotal Democratic Election. Stanford: Stanford University Press. Bruhn, Kathleen and Kenneth, F. Greene (2007) “Elite Polarization Meets Mass Moderation in Mexico's 2006 Elections” PS: Political Science and Politics 40, 1 (January): 33–37. Bruno, Giovanni and Luciano Segreto (1996) “Finanza e industria in Italia, 1963–1995” in Barbagallo, F. (ed.) L'Italia nella crisi mondiale: L'ultimo ventennio. Storia dell'Italia repubblicana Vol. 3, No. 1. Economia e società. Turin, Italy: Einaudi. Buendía, Jorge (2004) “The Changing Mexican Voter, 1991–2000” in Middlebrook, K. (ed.) Dilemmas of Political Change in Mexico. London: Institute of Latin American Studies, University of London. Cain, Bruce, John, Ferejohn, and Morris, Fiorina (1987) The Personal Vote: Constituency Service and Electoral Independence. New York: Cambridge University Press. Calder, Kent (1988) Crisis and Compensation: Public Policy and Political Stability in Japan. Princeton: Princeton University Press. Camp, Roderic (1995) Political Recruitment across Two Centuries: Mexico, 1884–1991. Austin: University of Texas Press. Camp, Roderic (2003) Politics in Mexico. 4th ed. Oxford: Oxford University Press. Campbell, John (1989) “Democracy and Bureaucracy in Japan” in Ishida, T. and Krauss, E. (eds.) Democracy in Japan. Pittsburgh: University of Pittsburgh Press. Carey, John and Mathew, Shugart (1995) “Incentives to Cultivate a Personal Vote: A Rank Ordering of Electoral Formulas” Electoral Studies 14, 4: 417–439. Carothers, Thomas (2002) “The End of the Transition Paradigm” Journal of Democracy 13, 1: 5–21. Carr, Barry (1985) Mexican Communism, 1968–1983: Eurocommunism in the Americas?La Jolla: Center for U.S.-Mexican Studies. Carr, Barry (1992) Marxism and Communism in Twentieth-Century Mexico. Lincoln: University of Nebraska Press. Case, William (2001) “Malaysia's Resilient Pseudodemocracy” Journal of Democracy 12, 1: 43–57. Castañeda, Jorge (2000) Perpetuating Power: How Mexican Presidents Were Chosen.New York: The New Press. Castles, Francis and Peter, Mair (1984) “Left-Right Political Scales: Some Expert Judgments” European Journal of Political Research 12, 83–88. Centeno, Miguel (1994) Democracy within Reason: Technocratic Revolution in Mexico. University Park: Pennsylvania State University Press. Chand, Vikram (2001) Mexico's Political Awakening. Notre Dame: University of Notre Dame Press. Chandra, Kanchan (2004) Why Ethnic Parties Succeed. New York: Cambridge University Press. Charlesworth, James (1948) “Is Our Two-Party System Natural?” Annals of the American Academy of Political and Social Science 259: 1–9. Chaudhry, Kiren (1997) The Price of Wealth: Economies and Institutions in the Middle East. Ithaca: Cornell University Press. Cheng, Tun-jen (2001) “One-Party Hegemony and Democratic Transition: Comparing Mexico, Taiwan and Turkey.” Paper prepared for presentation at Conference on The Rise of the DPP and PAN in Taiwan and Mexico, Duke University, January 26–27. Chhibber, Pradeep (2001) Democracy without Associations. Ann Arbor: University of Michigan Press. Chong, Dennis (1991) Collective Action and the Civil Rights Movement. Chicago: University of Chicago Press. Chong, Dennis (2000) Rational Lives: Norms and Values in Politics and Society. Chicago: University of Chicago Press. Christensen, Ray (2000) Ending the LDP Hegemony: Party Cooperation in Japan. Honolulu: University of Hawaii Press. Chu, Yun-han (2001) “The Legacy of One-Party Hegemony in Taiwan” in Diamond, L. and Gunther, R. (eds.) Political Parties and Democracy. Baltimore: Johns Hopkins University Press. Chua, Huat Beng (2001) “Defeat of the KMT: Implications for One-Party Quasi-Democratic Regimes in Southeast Asia” in Alagappa, M. (ed.) Taiwan's Presidential Politics: Democratization and Cross-Strait Relations in the Twenty-First Century. New York: M. E. Sharpe. Clark, Peter and James, Wilson (1961) “Incentive Systems: A Theory of Organizations” Administrative Studies Quarterly 6: 129–166. Cline, Howard (1962) Mexico: Revolution to Evolution, 1940–1960. London: Oxford University Press. Coleman, James (1960) “The Politics of Sub-Saharan Africa” in Almond, G. and Coleman, J. (eds.) The Politics of Developing Areas. Princeton: Princeton University Press. Collier, Ruth and David, Collier (1991) Shaping the Political Arena. Princeton: Princeton University Press. Collier, Ruth (1992) The Contradictory Alliance: State-Labor Relations and Regime Change in Mexico. Berkeley: International and Area Studies, University of California. Conover, Pamela Johnston and Stanley, Feldman (1989) “Candidate Perception in an Ambiguous World: Campaigns, Cues, and Inference Processes” American Journal of Political Science 33, 4 (November): 912–940. Cornelius, Wayne (1975) Politics and the Migrant Poor in Mexico City. Stanford: Stanford University Press. Cornelius, Wayne (2004) “Mobilized Voting in the 2000 Elections: The Changing Efficacy of Vote Buying and Coercion in Mexican Electoral Politics” in Domínguez, J. and Lawson, C. (eds.) Mexico's Pivotal Democratic Election. Stanford: Stanford University Press. Cornelius, Wayne and Ann, Craig (1991) The Mexican Political System in Transition. Monograph 35, Center for U.S.-Mexican Studies. Cotton, James (1997) “East Asian Democracy: Progress and Limits” in Diamond, L., Plattner, M., Chu, Y., and Tien, H. (eds.) Consolidating the Third Wave Democracies. Baltimore: Johns Hopkins University Press. Coulon, Christian (1990) “Senegal: The Development and Fragility of Semi-democracy” in Diamond, L., Linz, J., and Lipset, S. M. (eds.) Politics in Developing Countries: Comparing Experiences with Democracy. Boulder: Lynne Rienner. Cover, Albert and Bruce, Brumberg (1982) “Baby Books and Ballots: The Impact of Congressional Mail on Constituent Opinion” American Political Science Review 76, 2: 347–359. Cox, Gary (1987) “The Uncovered Set and the Core” American Journal of Political Science 31, 2: 408–422. Cox, Gary (1990) “Centripetal and Centrifugal Incentives in Electoral Systems” American Journal of Political Science 34, 4 (November): 903–935. Cox, Gary (1996) “Is the Single Nontransferable Vote Superproportional: Evidence from Japan and Taiwan” American Journal of Political Science 40, 3 (August): 740–755. Cox, Gary (1997) Making Votes Count. New York: Cambridge University Press. Crespo, Jos (1996) Votar en los estados: Análisis comparado de las legislaciones electorales estatales en México. Mexico City: Fundación Friedrich Naumann. Cross, John (1998) Informal Politics: Street Vendors and the State in Mexico City. Stanford: Stanford University Press. Crouch, Harold (1996) Government and Society in Malaysia. Ithaca: Cornell University Press. CuéllarVázquez, Angélica Vázquez, Angélica (1993) La noche es de ustedes, el amanecer es nuestro: Asamblea de Barrios y Superbarrio Gómez en la Ciudad de México. Mexico City: National Autonomous University of Mexico. Curtis, Gerald (1971) Election Campaigning, Japanese Style. New York: Columbia University Press. Curtis, Gerald (1988) The Japanese Way of Politics. New York: Columbia University Press. Curtis, Gerald (1999) The Japanese Logic of Politics. New York: Columbia University Press. Dahl, Robert (1992) “Why Free Markets Are Not Enough” Journal of Democracy 3, 3 (July): 82–89. Davis, Otto, Melvin, Hinich, and Peter, Ordeshook (1970) “An Expository Development of a Mathematical Model of the Electoral Process” American Political Science Review 64: 426–448. André, Palma, Gap-Seon, Hong, and Jean-Francoise, Thisse (1990) “Equilibria in Multi-Party Competition under Uncertainty” Social Choice and Welfare 7: 247–259. della, Porta and Alberto, Vannucci (1999) Corrupt Exchanges: Actors, Resources, and Mechanisms of Political Corruption. New York: Aldine and Gruyter. Deininger, Klaus and Lyn, Squire (1996) “A New Data Set Measuring Income Inequality” World Bank Economic Review 10, 3: 565–591. di Palma, Giuseppe (1980) “The Available State: Problems of Reform” in Lange, P. and Tarrow, S. (eds.) Italy in Transition. London: Frank Cass. Diamond, Larry (2001) “Anatomy of an Electoral Earthquake: How the KMT Lost and the DPP Won the 2000 Presidential Election” in Alagappa, M. (ed.) Taiwan's Presidential Politics. Armonk, NY: M. E. Sharpe. Diamond, Larry (2002) “Thinking about Hybrid Regimes” Journal of Democracy 13, 2 (April): 21–35. Diaw, Aminata and Mamadou Diouf (1998) “The Senegalese Opposition and its Quest for Power” in Olukoshi, A. (ed.) The Politics of Opposition in Contemporary Africa. Stockholm: Uppsala. Díaz-Cayeros, Alberto (1997) “Asignación política de recursos en el federalismo mexicano: Incentivos y restricciones” Perfiles Latinoamericanos 6, 10: 35–74. Díaz-Cayeros, Alberto, Federico Estévez, Beatriz Magaloni (2001) “A Portfolio Diversification Model of Electoral Investment: Competition and Policy Choice in Mexico's PRONASOL, 1989–1994” American Political Science Association Annual Meeting, San Francisco, August 30–September 2. Dillon, Samuel (2000) “Mexico's Ruling Party Accused of Diverting Public Money” New York Times, March 27, 2000: A6. Domínguez, Jorge and James, McCann (1996) Democratizing Mexico: Public Opinion and Electoral Choices. Baltimore: Johns Hopkins University Press. Dow, Jay and James, Endersby (2004) “Multinomial Probit and Multinomial Logit: A Comparison of Choice Models for Voting Research” Electoral Studies 23: 107–122. Downs, Anthony (1957) An Economic Theory of Democracy. New York: Harper and Row. Dresser, Denise (1991) Neopopulist Solutions to Neoliberal Problems: Mexico's National Solidarity Program. La Jolla: Center for U.S.-Mexican Studies. Duverger, Maurice (1954) Political Parties: Their Organization and Activity in the Modern State. Translated by Barbara and Robert North. New York: Wiley. Ebenstein, William (1945) “Public Administration in Mexico” Public Administration Review 5, 2 (Spring): 102–112. Eckstein, Susan (1977) The Poverty of Revolution: The State and the Urban Poor in Mexico. Princeton: Princeton University Press. Eisenstadt, Shmuel and Luis Roniger (1981) “The Study of Patron-Client Relations and Recent Developments in Sociological Theory” in Eisenstadt, S. N. and René Lémarchand, (eds. ), Political clientelism, Patronage, and Development. Beverly Hills: Sage. Eisenstadt, Todd (1999) “Electoral Justice in Mexico: From Oxymoron to Legal Norm in Less Than a Decade,” Third International Congress on Electoral Law, National Autonomous University of Mexico, UNAM-IIJ, Mexico City. Eisenstadt, Todd (2004) Courting Democracy in Mexico: Party Strategies and Electoral Institutions. New York: Cambridge University Press. Enelow, James and Melvin, Hinich (1982) “Nonspatial Candidate Characteristics and Electoral Competition” Journal of Politics 44: 115–130. Epstein, Leon (1986) Political Parties in the American Mold. Madison: University of Wisconsin Press. Esping-Andersen, G⊘sta (1985) Politics against Markets: The Social Democratic Road to Power. Princeton: Princeton University Press. Esping-Andersen, G⊘sta (1990) “Single-Party Dominance in Sweden: The Saga of Social Democracy” in Pempel, T. J. (ed.) Uncommon Democracies: The One-Party Dominant Regimes. Ithaca: Cornell University Press. Eyton, Laurence (2002) “Taiwan opposition shoots itself in the foot” Asia Times, June 29. http://www.atimes.com/china/DF29Ad01.html. Farneti, Paolo (1985) The Italian Party System, 1945–1980. New York: St. Martin's Press. Feddersen, Timothy, Itai, Sened, and Stephen, Wright (1990) “Rational Voting and Candidate Entry under Plurality Rule” American Journal of Political Science 34, 4: 1005–1016. Féher, Ferenc, Agnes, Heller, and Gyorgy, Markus (1983) Dictatorship over Needs. London: Basil Blackwell. Ferdinand, Peter (1998) “Party Funding and Political Corruption in East Asia: The Cases of Japan, South Korea and Taiwan” in Austin, R. and Tjernström, M. (eds.) Funding of Political Parties and Election Campaigns. Stockholm: International Institute for Democracy and Electoral Assistance. Fields, Karl (1998) “KMT, Inc. Party Capitalism in a Developmental State” JPRI Working Paper No. 47 (June). Fiorina, Morris (1981) Retrospective Voting in American National Elections. New Haven: Yale University Press. Fischer, Bernhard, Egbert, Gerken, and Ulrich, Hiemenz (1982) Growth, Employment, and Trade in an Industrializing Economy: A Quantitative Analysis of Mexican Development Policies. Tubingen: J. C. B. Mohr. Fish, Steven (1995) Democracy from Scratch: Opposition and Regime in the New Russian Revolution. Princeton: Princeton University Press. Fitzgibbon, Russell (1951) “Measurement of Latin-American Political Phenomena: A Statistical Experiment” American Political Science Review 45, 2 (June): 517–523. Garretón, Manuel Antonio (1989) The Chilean Political Process. Boston: Unwin Hyman. Garrido, Luis Javier (1987) “Un partido sin militantes” in Loaeza, S. and Segovia, R. (eds.) La vida política mexicana en la crisis. Mexico City: El Colegio de México. Geddes, Barbara (1994) Politician's Dilemma: Building State Capacity in Latin America. Berkeley: University of California Press. Geddes, Barbara (1999a) “What Do We Know About Democratization After Twenty Years?” Annual Review of Political Science 2: 115–144. Geddes, Barbara (1999b) “Authoritarian Breakdown: Empirical Test of a Game Theoretic Argument” American Political Science Association, Atlanta, September 2–5. Geddes, Barbara (2003) Paradigms and Sand Castles: Theory Building and Research Design in Comparative Politics. Ann Arbor: University of Michigan Press. Gerschenkron, Alexander (1962) Economic Backwardness in Historical Perspective. Cambridge, MA: Harvard University Press. Givens, Terri (2005) Voting Radical Right in Western Europe. New York: Cambridge University Press. Golden, Miriam (2000) “Political Patronage, Bureaucracy and Corruption in Postwar Italy.” Working Paper without number. Russell Sage Foundation. Golden, Miriam (2004) “International Economic Sources of Regime Change: How European Integration Undermined Italy's Postwar Party System” Comparative Political Studies 37, 10 (December): 1238–1274. Gomez, Edmund (1991) Money Politics in the Barisan Nasional. Kuala Lumpur: Forum. Gomez, Edmund (1994) Political Business: Corporate Involvement in Malaysian Political Parties. Cairns: James Cook University Press. Gomez, Edmund (2002) “Political Business in Malaysia: Party Factionalism, Corporate Development, and Economic Crisis” in Gomez, E. (ed.) Political Business in Asia. New York: Routledge. Gómez, Leopoldo and John, Bailey (1990) “La transición política y los dilemas del PRI” Foro Internacional 31, 1: 57–87. González, Casanova (1965) La democracia en México. Mexico City: Era. Goodliffe, Jay (2001) “The Effect of War Chests on Challenger Entry in U.S. House Elections” American Journal of Political Science 45, 4: 830–844. Green, Donald and Jonathan, Krasno (1988) “Salvation for the Spendthrift Incumbent: Reestimating the Effects of Campaign Spending in House Elections” American Journal of Political Science 32, 4: 884–907. Greenberg, Joseph and Kenneth, Shepsle (1987) “The Effects of Electoral Rewards in Multiparty Competition with Entry” American Political Science Review 81: 525–537. Greene, Kenneth F. (1997) “Complejidad, cohesión y longevidad en un movimiento urbano popular: La Asamblea de Barrios de la Ciudad de México” in Zermeño, S. (ed.) Movimientos sociales e identidades colectivas en México. Mexico City: UNAM-IIS. Greene, Kenneth F. (2002a) “Opposition Party Strategy and Spatial Competition in Dominant Party Regimes: A Theory and the Case of Mexico” Comparative Political Studies 35, 7 (September): 755–783. 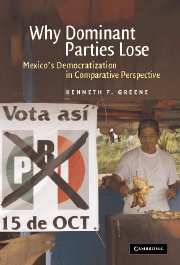 Greene, Kenneth F. (2002b) Defeating Dominance: Opposition Party Building and Democratization in Mexico. Unpublished Ph. D. Dissertation, Department of Political Science, University of California, Berkeley. Greene, Kenneth F. (2008) “Dominant Party Strategy and Democratization” American Journal of Political Science (forthcoming). Greene, Kenneth F., Joseph Klesner, and Chappell Lawson (2004) “How to Win a Mexican Election (Legally): Campaign Effects in a New Democracy” Latin American Studies Association, Las Vegas, Nevada, October 7–9. Grindle, Merilee (1977) Bureaucrats, Politicians, and Peasants in Mexico: A Case Study in Public Policy. Berkeley: University of California Press. Groseclose, Tim (2001) “A Model of Candidate Location When One Candidate Has a Valence Advantage” American Journal of Political Science 45, 4 (October): 862–886. Grzymala-Busse, Anna (2002) Redeeming the Communist Past: The Regeneration of Communist Parties in East Central Europe. Cambridge: Cambridge University Press. Guillermoprieto, Alma (1994) The Heart that Bleeds: Latin America Now. New York: Knopf. Guzzini, Stefano (1994) “The Implosion of Clientelistic Italy in the 1990s” Working Paper No. 94/12, European University Institute, Florence, Italy. Haber, Paul (1997) “¡Vamos por la dignidad de Durango! Un estudio del poder sociopolítico” in Zermeño, S. (ed.) Movimientos sociales e identidades colectivas en México. Mexico City: UNAM-IIS. Haber, Paul (2006) Power from Experience: Urban Popular Movements in Late Twentieth-Century Mexico. University Park: Pennsylvania State University Press. Haggard, Stephan and Robert, Kaufman (1995) The Political Economy of Democratic Transitions. Princeton: Princeton University Press. Hartz, Louis (1955) The Liberal Tradition in America: An Interpretation of American Political Thought Since the Revolution. New York: Harcourt Brace. Hechter, Michael (1987) Principles of Group Solidarity. Berkeley: University of California Press. Hellman, Judith Adler (1983) Mexico in Crisis. 2nd ed. New York: Holmes and Meier. Judith Adler, Hellman (1994) “Mexican Popular Movements, Clientelism, and the Process of Democratization.” Latin American Perspectives 21, 2: 124–142. Hellman, Stephen (1975) “Generational Differences in the Bureaucratic Elite of Italian Communist Provincial Federations” Canadian Journal of Political Science 1: 82–106. Hine, David (1987) “Italy: Parties and Government under Pressure” in Ware, A. (ed.) Political Parties. London: Blackwell. Hinich, Melvin and Michael, Munger (1997) Analytical Politics. New York: Cambridge University Press. Hirschman, Albert (1970) Exit, Voice, and Loyalty: Responses to Declines of Firms, Organizations, and States. Cambridge: Harvard University Press. Holm, John (1987) “Elections in Botswana: Institutionalization of a New System of Legitimacy” in Hayward, F. M. (ed.) Elections in Independent Africa. Boulder: Westview Press. Howard, Marc and Phillip, Roessler (2006) “Liberalizing Electoral Outcomes in Competitive Authoritarian Regimes” American Journal of Political Science 50, 2 (April): 365–381. Hrebenar, Ronald (2000) Japan's New Party System. Boulder: Westview Press. Hsieh, John Fuh-sheng, Dean, Lacy, and Emerson, Niou (1998) “Retrospective and prospective voting in a one-party-dominant democracy: Taiwan's 1996 presidential election” Public Choice 97: 383–399. Huang, Teh-fu and Ching-shin Yu (1999) “Developing a Party System and Democratic Consolidation” in Tsang, S. and Tien, H. (eds.) Democratization in Taiwan: Implications for China. New York: St. Martin's Press. Hug, Simon (2001) Altering Party Systems. Ann Arbor: University of Michigan Press. Huntington, Samuel (1970) “Social and Institutional Dynamics of One-Party Systems” in Huntington, S. and Moore, C. (eds.) Authoritarian Politics in Modern Society: The Dynamics of Established One-Party Dominant Systems. New York: Basic Books. Huntington, Samuel and Clement Moore (1970) “Conclusion: Authoritarianism, Democracy, and One-Party Politics” in Huntington, S. and Moore, C. (eds.) Authoritarian Politics in Modern Society: The Dynamics of Established One-Party Dominant Systems. New York: Basic Books. Inoguchi, Takashi (1990) “The Political Economy of Conservative Resurgence under Recession: Public Policies and Political Support in Japan, 1977–1983” in Pempel, T. J. (ed.) Uncommon Democracies: The One-Party Dominant Regimes. Ithaca: Cornell University Press. Jackson, John (1999) “Electoral Competition with Endogenous Activists” American Political Science Association Annual Meeting, Atlanta, Georgia, September 2–5. Jacobson, Gary (1980) Money in Congressional Politics. New Haven: Yale University Press. Jacobson, Gary and Samuel, Kernell (1981) Strategy and Choice in Congressional Elections. New Haven: Yale University Press. Johnson, Chalmers (1982) MITI and the Japanese Miracle: The Growth of Industrial Policy, 1925–1975. Stanford: Stanford University Press. Johnson, Kenneth (1965) “Ideological Correlates of Right Wing Political Alienation in Mexico” American Political Science Review 59, 3 (September): 656–664. Johnson, Kenneth (1978) Mexican Democracy: A Critical View. New York: Praeger. Johnston, Richard, André, Blais, Henry, Brady, and Jean, Crête (1992) Letting the People Decide: Dynamics of a Canadian Election. Stanford: Stanford University Press. Jones, Mark and Scott, Mainwaring (2003) “The Nationalization of Parties and Party Systems: An Empirical Measure and an Application to the Americas” Party Politics 9 (March): 139–166. Jowitt, Kenneth (1992) New World Disorder: The Leninist Extinction. Berkeley: University of California Press. Kalyvas, Stathis (1996) The Rise of Christian Democracy in Europe. Ithaca: Cornell University Press. Karl, Terry (1986) “Imposing Consent? Electoralism vs. Democratization in El Salvador” in Drake, P. and Silva, E. (eds.) Elections in Latin America. La Jolla: Institute of Latin American Studies, University of California, San Diego. Karl, Terry and Philippe, Schmitter (1991) “What Democracy Is … And Is Not” Journal of Democracy 2 (Summer): 75–89. Katz, Richard and Peter, Mair (1995) “Changing Models of Party Organization and Party Democracy: The Emergence of the Cartel Party” Party Politics 1, 1: 5–28. Kaufman, Purcell (1973) “Decision-Making in an Authoritarian Regime: Theoretical Implications from a Mexican Case Study” in World Politics 26, 1 (October): 28–54. Kessler, Timothy (1999) Global Capital and National Politics: Reforming Mexico's Financial System. Westport: Praeger. Key, V. O. (1964a) Southern Politics in State and Nation. New York: Knopf. Key, V. O. (1964b) Politics, Parties, and Pressure Groups. New York: Crowell. Key, V. O. (1966) The Responsible Electorate: Rationality in Presidential Voting, 1936–1960. Cambridge: Belknap Press of Harvard University Press. King, Gary, Robert, Keohane, and Sidney, Verba (1994) Designing Social Inquiry. Princeton: Princeton University Press. King, Gary, Michael, Tomz, and Jason, Wittenberg (2000) “Making the Most of Statistical Analyses: Improving Interpretation and Presentation” American Journal of Political Science 44, 2 (April): 347–61. Kirchheimer, Otto (1966) “The Transformation of West European Party Systems” in LaPalambara, J. and Weiner, M. (eds.) Political Parties and Political Development. Princeton: Princeton University Press. Kitschelt, Herbert (1989a) The Logics of Party Formation: Ecological Politics in Belgium and West Germany. Ithaca: Cornell University Press. Kitschelt, Herbert (1989b) “The Internal Politics of Parties: The Law of Curvilinear Disparity Revisited” Political Studies 37, 3: 400–421. Kitschelt, Herbert (1990) Beyond the European Left: Ideology and Political Action in the Belgian Ecology Parties. Durham: Duke University Press. Kitschelt, Herbert (1994) The Transformation of European Social Democracy. New York: Cambridge University Press. Kitschelt, Herbert (1995) The Radical Right in Western Europe. Ann Arbor: University of Michigan Press. Kitschelt, Herbert (2000) “Linkages between Citizens and Politicians in Democratic Polities” Comparative Political Studies 33, 6/7 (August/September): 845–879. Kitschelt, Herbert and Steve, Wilkinson (eds.) (2007) Patrons, Clients and Policies: Patterns of Democratic Accountability and Political Competition. Cambridge: Cambridge University Press. Klesner, Joseph (1994) “Realignment or Dealignment? Consequences of Economic Crisis and Restructuring for the Mexican Party System” in Cook, M., Middlebrook, K., and Molinar, J. (eds.) Politics of Economic Restructuring: State–Society Relations and Regime Change in Mexico. La Jolla: Center for U.S.–Mexican Studies. Klesner, Joseph (1997) “Electoral Reform in Mexico's Hegemonic Party System: Perpetuation of Privilege or Democratic Advance?” American Political Science Association Annual Meeting, Washington, DC, August 28–31. Kollman, Kenneth, John, Miller, and Scott, Page (1992) “Adaptive Parties in Spatial Elections” American Political Science Review 86, 4: 929–937. Kostoris, Fiorella (1993) Italy: The Sheltered Economy. Oxford: Oxford University Press. Krauze, Enrique (1997) Mexico, Biography of Power: A History of Modern Mexico, 1810–1996, Translated by Hank Heifetz. New York: HarperCollins. Kuo, Chengtian (2000) “New Financial Politics in Taiwan, Thailand, and Malaysia,” Department of Political Science, National Chengchi University, http://www.la.utexas.edu_research/cgots/ accessed 9/2305. Kuran, Timur (1991) “Now out of Never: The Element of Surprise in the East European Revolution of 1989” World Politics 44 (October): 7–48. Laakso, Markku and Rein, Taagapera (1979) “Effective Number of Parties: A Measure with Application to West Europe” Comparative Political Studies 12: 3–27. Langston, Joy (2001) “Why Rules Matter: Changes in Candidate Selection in Mexico's PRI, 1988–2000” Journal of Latin American Studies 33: 485–511. LaPalombara, Joseph (1964) Interest Groups in Italian Politics. Princeton: Princeton University Press. Laver, Michael and Norman, Schofield (1990) Multiparty Government. Oxford: Oxford University Press. Lawson, Chappell (2002) Building the Fourth Estate: Democratization and the Rise of a Free Press in Mexico. Berkeley: University of California Press. Lawson, Chappell (2004) “Television Coverage, Vote Choice, and the 2000 Campaign” in Domínguez, J. and Lawson, C. (eds.) Mexico's Pivotal Democratic Election. Stanford: Stanford University Press. Lehoucq, Fabrice (2003) “Electoral Fraud: Causes, Types, and Consequences” Annual Review of Political Science 6: 233–256. Levite, Ariel and Sydney, Tarrow (1983) “The Legitimation of Excluded Parties in Dominant Party Systems: A Comparison of Israel and Italy” Comparative Politics 15, 3 (April): 295–327. Levitsky, Steven (2003) Transforming Labor-Based Parties in Latin America: Argentine Peronism in Comparative Perspective. New York: Cambridge University Press. Levitsky, Steven and Lucan, Way (2002) “The Rise of Competitive Authoritarianism” Journal of Democracy 13, 2: 51–65. Levitsky, Steven and Lucan Way (2006) “Competitive Authoritarianism: The Origins and Evolution of Hybrid Regimes after the Cold War.” Unpublished manuscript of chapters 1 and 2, Harvard University and University of Toronto. Levitt, Steven and Catherine, Wolfram (1997) “Decomposing the Sources of Incumbency Advantage in the U.S. House” Legislative Studies Quarterly 22: 45–60. Lichbach, Mark (1996) The Cooperator's Dilemma. Ann Arbor: University of Michigan Press. Lichbach, Mark (1998) The Rebel's Dilemma. Ann Arbor: University of Michigan Press. Lin, Oliver (2000) “Lien wants KMT assets put in trust” Taipei Times, January 3: A1. Lin, Tse-min, James, Enelow, and Han, Dorussen (1999) “Equilibrium in Multicandidate Probabilistic Voting” Public Choice 98: 59–82. Lin, Tse-min (2007) “The ‘Minumum-Sum Point’ as a Solution Concept in Spatial Voting” Paper presented at the Midwest Political Science Association meeting, Chicago IL, April 12–15. Linz, Juan and Arturo, Valenzuela (eds.) (1994) The Failure of Presidential Democracy. Baltimore: Johns Hopkins University Press. Lipset, Seymour Martin (ed.) (1998) Democracy in Europe and the Americas. Washington, DC: Congressional Quarterly. Lipset, Seymour Martin and Stein Rokkan (1967) “Cleavage Structures, Party Systems, and Voter Alignments: An Introduction” in Lipset, S. M. and Rokkan, S. (eds.) Party Systems and Voter Alignments: Cross–National Perspectives. New York: Free Press. Lipson, Leslie (1953) “The Two–Party System in British Politics” American Political Science Review 47: 337–358. Liu, I-chou (1999) “The Development of the Opposition” in Tsang, S. and Tien, H. (eds.) Democratization in Taiwan: Implications for China. New York: St. Martin's Press. Loaeza, Soledad (1999) El Partido Acción Nacional, la larga marcha, 1939–1994: Oposición leal y partido de protesta. Mexico City: Fonda de Cultura Económica. Locke, Richard (1995) Remaking the Italian Economy. Ithaca: Cornell University Press. Londregan, John and Tom Romer (1993) “Polarization, Incumbency and the Personal Vote” in Barnett, W., Hinich, M. and Schofield, N. (eds.) Political Economy: Institutions, Competition and Representation. New York: Cambridge University Press. Lujambio, Alonso (2000) El poder compartido: Un ensayo sobre la democratización mexicana. Mexico City: Oceano. Lujambio, Alonso (2001) “Dinero y democratización: El financiamiento y la fiscalización de los partidos políticos en la transición mexicana a la democracia, 1988–2000.” International Seminar on Money and Electoral Competition: Challenges for Democracy, Federal Elections Institute, Mexico City, June 5–8. Lustig, Nora (1992) Mexico: the Remaking of an Economy. Washington, DC: The Brookings Institution. Mabry, Donald (1973) Mexico's Acción Nacional: A Catholic Alternative to Revolution. Syracuse: Syracuse University Press. MacLeod, Dag (2004) Downsizing the State: Privatization and the Limits of Neoliberal Reform in Mexico. University Park: Pennsylvania State University Press. Magaloni, Beatriz (1996) “Dominancia de partido y dilemas duvergerianos en las elecciones federales de 1994” Política y Gobierno 3, 2: 281–326. Magaloni, Beatriz (1997) The Dynamics Of Dominant Party Decline: The Mexican Transition To Multipartyism. Unpublished Ph. D. Dissertation, Department of Political Science, Duke University. Magaloni, Beatriz (2006) Voting for Autocracy: Hegemonic Party Survival and its Demise in Mexico. New York: Cambridge University Press. Magaloni, Beatriz and Alejandro Poiré (2004a) “The Issues, the Vote, and the Mandate for Change” in Domínguez, J. and Lawson, C. (eds.) Mexico's Pivotal Democratic Election. Stanford: Stanford University Press. Magaloni, Beatriz and Alejandro Poiré (2004b) “Strategic Coordination in the 2004 Mexican Presidential Race” in Domínguez, J. and Lawson, C. (eds.) Mexico's Pivotal Democratic Election. Stanford: Stanford University Press. Magar, Eric and Juan Molinar Horcasitas (1995) “Medios de comunicación y democracia” in Alcocer, J. (ed.) Elecciones, diálogo y reforma en México, 1994, Volume 2. Mexico City: Nuevo Horizonte. Mainwaring, Scott (1999) Rethinking Party Systems in the Third Wave of Democratization: The Case of Brazil. Stanford: Stanford University Press. Mair, Peter and Biezen, Ingrid (2001) “Party Membership in Twenty European Democracies, 1980–2000” Party Politics 7, 1: 5–21. Manikas, Peter and Laura, Thornton (2003) Political Parties in Asia: Promoting Reform and Combating Corruption in Eight Countries. Washington, DC: National Democratic Institute. MartínezValle, Adolfo Valle, Adolfo (1995) El Partido Acción Nacional: Una historia política, 1939–1976. Unpublished B.A. thesis, Department of Political Science, Autonomous Technological Institute of Mexico (ITAM), Mexico City. Martínez, Verdugo (1985) Historia del comunismo en México. Mexico City: Grijalbo. Martínez, Omar (2002) “Datos duros sobre monitoreos de coberturas electorales” http://www.cem.itesm.mx/dacs/buendia/rmc/rmc63/omartinez.html, accessed 10/10/02. May, John (1973) “Opinion Structures and Political Parties: The Special Law of Curvilinear Disparity” Political Studies 21: 135–151. McCann, James and Chappell, Lawson. 2003. “An Electorate Adrift? Public Opinion and the Quality of Democracy in Mexico” Latin American Research Review 38, 3 (October): 60–81. McDonald, Ronald (1971) Party Systems and Elections in Latin America. Chicago: Markham. McKelvey, Richard (1986) “Covering, Dominance, and Institution–Free Properties of Social Choice” American Journal of Political Science 30, 2: 283–314. Means, Gordon Paul (1996) “Soft Authoritarianism in Malaysia and Singapore” Journal of Democracy 7, 4 (October): 103–117. Meguid, Bonnie (2005) “Competition between Unequals: The Role of Mainstream Party Strategy in Niche Party Success” American Political Science Review 99, 3 (August): 347–359. Merino, Mauricio (1996) “De la lealtad individual a la responsabilidad pública” Revista de Administración Pública 91: 5–18. Mershon, Carol and Gianfranco, Pasquino (eds.) (1995) Italian Politics: Ending the First Republic. Boulder: Westview Press. Middlebrook, Kevin (1986) “Political Liberalization in an Authoritarian Regime: The Case of Mexico” in Donnell, G. O', Schmitter, P., and Whitehead, L. (eds.). Transitions from Authoritarian Rule: Latin America. Baltimore: Johns Hopkins University Press. Middlebrook, Kevin (1995) The Paradox of Revolution: Labor, The State, and Authoritarianism in Mexico. Baltimore: The Johns Hopkins University Press. Miller, Warren and Donald, Stokes (1963) “Constituency influence in Congress” American Political Science Review 57 (March): 45–56. Miller, Warren and Kent, Jennings (1986) Parties in Transition: A Longitudinal Study of Party Elites and Party Supporters. New York: Russell Sage Foundation. Mizrahi, Yemile (1998) “The Costs of Electoral Success: The Partido Acción Nacional in Mexico” in Serrano, M. (ed.). Governing Mexico: Political Parties and Elections. London: Institute of Latin American Studies. Mizrahi, Yemile (2003) From Martyrdom to Power: The Partido Acción Nacional in Mexico. Notre, Dame: University of Notre Dame Press. MoctezumaBarragán, Esteban Barragán, Esteban and Andrés, Roemer (2001) A New Public Management in Mexico. Burlington: Ashgate. Moe, Terry (1980) The Organization of Interests: Incentives and the Internal Dynamics of Political Interest Groups. Chicago: University of Chicago Press. Juan, Molinar Horcasitas (1991) El tiempo de la legitimidad. Mexico City: Cal y Arena. Molinar Horcasitas, Juan (2001) “Las elecciones de 1997 en México: Evaluación del sistema de partidos y la reforma electoral en materia de regulación financiera.” Conference on Political Parties and Elections, Federal Elections Institute (IFE), Mexico City. http://www.trife.gob.mx/wcongreso/molinarc.html. Molinar Horcasitas, Juan and Jeffrey Weldon (1994) “Electoral Determinants and Consequences of National Solidarity” in Cornelius, W., Craig, A., and Fox, J. (eds.) Transforming State–Society Relations in Mexico: The National Solidarity Strategy. La Jolla: Center for U.S.–Mexican Studies. Moreno, Alejandro (1999) “Ideología y voto: Dimensiones de competencia política en México en los noventa” Política y Gobierno 6, 1: 45–81. Moreno, Alejandro (2003) El votante mexicano: Democracia, actitudes políticas y conducta electoral. Mexico City: Fonda de Cultura Económica. Munro-Kua, Anne (1996) Authoritarian Populism in Malaysia. London: MacMillan. Muramatsu, Michio and Ellis Krauss (1990) “The Dominant Party and Social Coalitions in Japan” in Pempel, T. J. (ed.) Uncommon Democracies: The One-Party Dominant Regimes. Ithaca: Cornell University Press. Needler, Martin (1971) Politics and Society in Mexico. Albuquerque: University of New Mexico Press. Niou, Emerson and Peter, Ordeshook (1992) “A Game Theoretic Analysis of the Republic of China's Emerging Electoral System” International Political Science Review 13, 1: 59–79. O'Donnell, Guillermo and Philippe, Schmitter (1986) Transitions from Authoritarian Rule: Tentative Conclusions about Uncertain Democracies. Baltimore: Johns Hopkins University Press. Olson, Mancur (1971) The Logic of Collective Action: Public Goods and the Theory of Groups. Cambridge: Harvard University Press. Olukoshi, Adebayo (1998) “Introduction” in A. Adebayo (ed.) The Politics of Opposition in Contemporary Africa. Uppsala: Nordiska Afrikainstitutet. Oppenheimer, Andrés (1996) Bordering on Chaos: Guerrillas, Stockbrokers, Politicians, and Mexico's Road to Prosperity. Boston: Little, Brown. Pardo, Ortiz, , Francisco and Ortiz Pinchetti, Francisco (2000) “La meta: 20 millones de votos” Proceso 1215 (February 13): 12–24. Ortiz, Francisco (2002) Comprender a la gente: Por qué ganó Fox. Mexico City: Nuevo Siglo. Osborne, Martin and Al, Slivinski (1996) “A Model of Political Competition with Citizen–Candidates” Quarterly Journal of Economics 111, 1: 65–96. Osei-Hwedie, Bertha (2001) “The Political Opposition in Botswana: The Politics of Factionalism and Fragmentation” Transformation 45: 57–77. Otake, Hideo (1990) “Defense Controversies and One–Party Dominance: The Opposition in Japan and West Germany” in Pempel, T. J. (ed.) Uncommon Democracies: The One–Party Dominant Regimes. Ithaca: Cornell University Press. Padgett, Leon (1976) The Mexican Political System, 2d ed. Boston: Houghton Mifflin. Palfrey, Thomas (1984) “Spatial Equilibrium with Entry” Review of Economic Studies 51, 1: 139–156. Panebianco, Angelo (1988) Political Parties: Organization and Power. New York: Cambridge University Press. Pempel, T. J. (1990) “Introduction. Uncommon Democracies: The One-Party Dominant Regimes” in Pempel, T. J. (ed.) Uncommon Democracies: The One-Party Dominant Regimes. Ithaca: Cornell University Press. Pempel, T. J. (1998) Regime Shift: Comparative Dynamics of the Japanese Political Economy. Ithaca: Cornell University Press. Pignatelli, Andrea (1985) “Italy: The Development of a Late Developing State” in Rose, R. (ed.) Public Employment in Western Nations. New York: Cambridge University Press. Poiré, Alejandro (1999) “Retrospective Voting, Partisanship, and Loyalty in Presidential Elections: 1994” in Domínguez, J. and Poiré, A. (eds.) Toward Mexico's Democratization. New York: Routledge. Pomper, Gerald (1992) Passions and Interests: Political Party Concepts of American Democracy. Lawrence: University Press of Kansas. Prescott, Edward and Michael, Visscher (1977) “Sequential Location among Firms with Foresight” Bell Journal of Economics 8: 378–393. Preston, Julia and Samuel, Dillon (2004) Opening Mexico. New York: Farrar, Straus and Giroux. Prud'homme, Jean-Francois (1997) “El PRD: Su vida interna y sus elecciones estratégicas.” Working Paper No. 39. División de Estudios Políticos, Centro de Investigación y Docencia Económicas (CIDE), Mexico City. Przeworski, Adam and John, Sprague (1986) Paper Stones: A History of Electoral Socialism. Chicago: University of Chicago Press. Przeworski, Adam, Michael, Alvarez, José, Cheibub, and Fernando, Limongi (2000) Democracy and Development. New York: Cambridge University Press. Putnam, Robert (1971) “Studying Elite Political Culture: The Case of ‘Ideology’” American Political Science Review 65, 3 (September): 651–681. Putnam, Robert (1975) “The Italian Communist Politician” in Blackmer, D. and Tarrow, S. (eds.) Communism in Italy and France. Princeton: Princeton University Press. Rahim, Lily (2001) “The Political Agenda Underpinning Economic Policy Formulation in Singapore's Authoritarian Developmental State” in Johannen, U. and Gomez, J. (eds.) Democratic Transitions in Asia. Singapore: Select Publishing. Ramanadham, V. V. (ed.) (1995) Privatization and Equity. New York: Routledge. Ramírez Saiz, Juan Manuel (1986) El movimiento urbano popular en México. Mexico, D.F. : Siglo Veintiuno. Reed, Steven and Ethan, Scheiner (2003) “Electoral Incentives and Policy Preferences: Mixed Motives Behind Party Defections in Japan” British Journal of Political Science 33: 469–490. RevelesVásquez, Francisco Vásquez, Francisco (1996) El proceso de institucionalización organizativa del Partido Acción Nacional, 1984–1995. Unpublished Ph. D. Dissertation, Faculty of Political Science, National Autonomous University of Mexico. Reyna, José Luis and Richard, Weinert (eds.) (1977) Authoritarianism in Mexico. Philadelphia: Institute for the Study of Human Issues, Inter-American Politics Series. Richardson, Bradley (1997) Japanese Democracy: Power, Coordination, and Performance. New Haven: Yale University Press. Richardson, Bradley (2001) “Japan's ‘1955 System’ and Beyond” in Diamond, L. and Gunther, R. (eds.) Political Parties and Democracy. Baltimore: Johns Hopkins University Press. Rigger, Shelley (2001a) From Opposition to Power: Taiwan's Democratic Progressive Party. Boulder: Lynne Rienner. Rigger, Shelley (2001b) “The Democratic Progressive Party in 2000: Obstacles and Opportunities” China Quarterly 168: 944–959. Riker, William (1976) “The Number of Political Parties: A Reexamination of Duverger's Law” Comparative Politics 9, 1: 93–106. Riker, William (1983) “Political Theory and the Art of Heresthetics” in Finifter, A. (ed.) Political Science: The State of the Discipline. Washington, DC: American Political Science Association. Rimanelli, Marco (1999) Comparative Democratization and Peaceful Change in Single-Party-Dominant Countries. New York: St. Martin's Press. Rivera, Ríos, Miguel, Angel (1986) Crisis y reorganización del capitalismo mexicano, 1960–1985. Mexico City: Ediciones Era. Rocha, Menocal (2001) “Do Old Habits Die Hard? A Statistical Exploration of the Politicization of Progresa, Mexico's Latest Federal Poverty-Alleviation Programme, under the Zedillo Administration” Journal of Latin American Studies 33, 51: 513–558. Octavio, Rodríguez Araujo and Carlos, Sirvent (2005) Instituciones electorales y partidos polítocs en México. Mexico City: Jorale. Roeder, Philip (2001) “Ethnolinguistic Fractionalization (ELF) Indices, 1961 and 1985.” http//:weber.ucsd.edu\~proeder\elf.htm, accessed December 10, 2003. Rogozinski, Jacques (1993) La privatización de empresas paraestatales. Mexico City: Fondo de Cultura Económica. Rohde, David (1979) “Risk-bearing and Progressive Ambition: The Case of the United States House of Representatives” American Journal of Political Science 23 (February), 1–26. Rosenstone, Steve, Roy, Behr, and Edward, Lazarus (1984) Third Parties in America. Princeton: Princeton University Press. Ross, Michael (2001) “Does Oil Hinder Democracy?” World Politics 53, 3 (April): 325–361. Saldierna, Georgina (1999) “Dar prioridad al frente nacional progresista, pide López Obrador” La Jornada, (January 18): 3. Salinas, Carlos (1994) “Sexto Informe de Gobierno, Anexo Estadístico” Mexico City: Poder Ejecutivo Federal. Samuels, David (2002) “Presidentialized Parties: The Separation of Power and Party Organization and Behavior” Comparative Political Studies 35, 4 (May): 461–483. Sánchez, Marco Aurelio (1999) PRD, la elite en crisis: Problemas organizativos, indeterminación ideológica y deficiencias programáticas. Mexico City: Plaza y Valdés. Sanderson, Steven (1981) Agrarian Populism and the Mexican State. Berkeley: University of California Press. Sartori, Giovanni (1968) “The Sociology of Parties: A Critical Review” in Stammer, O. (ed.) Party Systems, Party Organizations, and the Politics of New Masses. Berlin: Institute for Political Science, Free University of Berlin. Sartori, Giovanni (1976) Parties and Party Systems: A Framework for Analysis. New York: Cambridge University Press. Schattschneider, E. E. (1942) Party Government. New York: Rinehart. Schedler, Andreas (2002) “The Menu of Manipulation” Journal of Democracy 13, 2 (April): 36–50. Schedler, Andreas (2005) “From Electoral Authoritarianism to Democratic Consolidation” in Crandall, R., Paz, G., and Roett, R. (eds.) Mexico's Democracy at Work. Boulder: Lynne Rienner. Scheiner, Ethan (2006) Democracy without Competition: Opposition Failure in a One-Party Dominant State. New York: Cambridge University Press. Schlesinger, Jacob (1997) Shadow Shoguns: The Rise and Fall of Japan's Political Machine. Stanford: Stanford University Press. Schlesinger, Joseph (1966) Ambition and Politics: Political Careers in the United States. Chicago: Rand McNally. Schlesinger, Joseph (1991) Political Parties and the Winning of Office. Ann Arbor: University of Michigan Press. Schmitt, Karl (1970) Communism in Mexico. Austin: University of Texas Press. Schumpeter, Joseph (1947) Capitalism, Socialism, and Democracy. New York: Harper. Scott, Robert (1964) Mexican Government in Transition. Urbana: University of Illinois Press. Semo, Enrique (2003) La búsqueda, 1. La izquierda mexicana en los albores del siglo XⅪ. Mexico City: Oceano. Shadlen, Ken (2004) Democratization without Representation: The Politics of Small Industry in Mexico. University Park: Pennsylvania State University Press. Shalev, Michael (1990) “The Political Economy of Labor-Party Dominance and Decline in Israel” in Pempel, T. J. (ed.) Uncommon Democracies: The One-Party Dominant Regimes. Ithaca: Cornell University Press. Shefter, Martin (1977a) “Patronage and its Opponents: A Theory and Some European Cases,” Cornell University Western Societies Program Occasional Paper No. 8. Shefter, Martin (1977b) “Party and Patronage: Germany, England, and Italy” Politics and Society 7: 403–451. Shefter, Martin (1994) Political Parties and the State: The American Historical Experience. Princeton: Princeton University Press. Shirk, David (2005) Mexico's New Politics: The PAN and Democratic Change. Boulder: Lynne Rienner. Shvetsova, Olga (1995) Design of Political Institutions in Divided Societies. Unpublished Ph. D. Dissertation, Department of Political Science, California Institute of Technology. Singh, Hari (2000) “Opposition Politics and the 1999 Malaysian Elections” Trends in Malaysia: Election Assessment 1 (January): 33–38. Skocpol, Theda and Margaret, Somers (1980) “The Uses of Comparative History in Macrosocial Inquiry” Comparative Studies in Society and History 22: 174–197. Smith, Benjamin (2005) “Life of the Party: The Origins of Regime Breakdown and Persistence under Single-Party Rule” World Politics 57 (April): 421–451. Smith, Peter H. (1979) Labyrinths of Power: Political Recruitment in Twentieth-Century Mexico. Princeton: Princeton University Press. Smith, Peter H. (1989) “The 1988 Presidential Succession in Historical Perspective” in Cornelius, W., Gentleman, J., and Smith, P. (eds.) Mexico's Alternative Political Futures. La Jolla: Center for U.S.-Mexican Studies. Snyder, James (1994) “Safe Seats, Marginal Seats, and Party Platforms: The Logic of Platform Differentiation” Economics and Politics 6: 201–214. Snyder, Richard (2001) Politics after Neoliberalism: Reregulation in Mexico. New York: Cambridge University Press. Solinger, Debra (2001) “Ending One-Party Dominance: Korea, Taiwan, Mexico” Journal of Democracy 12, 1: 30–42. Spotts, Frederic and Theodor, Wieser (1986) Italy: A Difficult Democracy. New York: Cambridge University Press. Stokes, Susan (2001) Mandates and Democracy: Neoliberalism by Surprise in Latin America. New York: Cambridge University Press. Stokes, Susan (2007) “Political Clientelism” in Boix, C. and Stokes, S. (ed.) Handbook of Comparative Politics. Oxford: Oxford University Press. Stone, Walter, Sandy, Maisel, and Cherie, Maestas (2004) “Quality Counts: Extending the Strategic Politician Model of Incumbent Deterrence” American Journal of Political Science 48, 3 (July): 479–495. Taagapera, Rein and Matthew, Shugart (1991) Seats and Votes: The Effects and Determinants of Electoral Systems. New Haven: Yale University Press. Tarrow, Sidney (1967) Peasant Communism in Southern Italy. New Haven: Yale University Press. Tarrow, Sidney (1990) “Maintaining Hegemony in Italy: ‘The Softer they Rise, the Slower they Fall!’” in Pempel, T. J. (ed.) Uncommon Democracies: The One-Party Dominant Regimes. Ithaca: Cornell University Press. Tarrow, Sydney (1994) Power in Movement. New York: Cambridge University Press. Teh, Yik Koon (2002) “Money Politics in Malaysia” Journal of Contemporary Asia 32, 3: 338–345. Tien, Hung-mao (1997) “Taiwan's Transformation” in Diamond, L., Plattner, M., Chu, Y., and Tien, H. (eds.) Consolidating the Third Wave Democracies. Baltimore: Johns Hopkins University Press. Tien, Hung-mao and Tun-jen Cheng (1999) “Crafting Democratic Institutions” in Tsang, S. and Tien, H. (eds.) Democratization in Taiwan: Implications for China. New York: St. Martin's Press. Trejo, Guillermo and Claudio Jones (1998) “Political Dilemmas of Welfare Reform: Poverty and Inequality in Mexico” in Purcell, S. and Rubio, L. (eds. ), Mexico under Zedillo. Boulder: Lynne Rienner. Trejo Delabre, Raúl (2000) “Procesos electorales y medios de comunicación” Federal Elections Institute, Mexico City. http://www.raultrejo.tripod.com/ensayosmedios/ProcesoselectoralesymediosIFEmayo00ppt, accessed 12/7/05. Tsebelis, George (1990) Nested Games: Rational Choice in Comparative Politics. Berkeley: University of California Press. Tucker, Robert (1961) “Towards a Comparative Politics of Movement-Regimes” American Political Science Review 55, 2 (June): 281–289. Tucker, Robert (1965) “The Dictator and Totalitarianism” World Politics 17, 4: 555–583. Tullock, Gordon (1971) “The Paradox of Revolution” Public Choice 11 (Fall): 89–99. Nicolas, Walle (2002) “Africa's Range of Regimes” Journal of Democracy 13, 2 (April): 66–80. Van de Walle, Nicolas (2006) “Tipping Games: When Do Opposition Parties Coalesce?” in Schedler, A. (ed.) Electoral Authoritarianism. Boulder: Lynne Rienner. Nicolas, Walle and Kimberly, Butler (1999) “Political Parties and Party Systems in Africa's Illiberal Democracies” Cambridge Review of International Affairs 12, 1: 14–28. Ware, Alan (1996) Political Parties and Party Systems. New York: Oxford University Press. Warner, Carolyn (1998) “Getting out the Vote with Patronage and Threat: The French and Italian Christian Democratic Parties, 1945–1958” Journal of Interdisciplinary History 28, 4: 553–582. Weiner, Robert (2003) Anti-competition in ‘Competitive’ Party Systems. Unpublished Ph. D. Dissertation, Department of Political Science, University of California, Berkeley. Weldon, Jeffrey (2004) “Changing Patterns of Executive-Legislative Relations in Mexico” in J. Middlebrook (ed.) Dilemmas of Political Change in Mexico. London: Institute of Latin American Studies, University of London. White, James (1970) The Sokagakkai and Mass Society. Stanford: Stanford University Press. Wittman, Donald (1983) “Candidate Motivation: A Synthesis of Alternative Theories” American Political Science Review 77, 1: 142–157. Woodall, Brian (1996) Japan under Construction: Corruption, Politics, and Public Works. Berkeley: University of California Press. World Bank, World Development Report 2000–2001. Washington, DC: World Bank. Xu, Dianqing (1997) “The KMT Party's Enterprises in Taiwan” Modern Asian Studies 31, 2: 399–413. Zaller, John (1998) “Politicians as Prize Fighters: Electoral Selection and Incumbency Advantage” in Geer, J. (ed.) Politicians and Party Politics. New York: Palgrave Macmillan. Zarembo, Alan (2001) “Truth and Consequences” Newsweek International (December 10): 40. Zermeño, Sergio (1982) “De Echeverría a de la Madrid: Las clases altas y el estado mexicano en la batalla por la hegemonía. Washington, DC: Wilson Center, Working Paper 118. Zolberg, Aristide (1966) Creating Political Order: The Party-States of West Africa. Chicago: Rand McNally. Zuckerman, Alan (1979) The Politics of Faction: Christian Democratic Rule in Italy. New Haven: Yale University Press.